Sinsa-dong is one of Gangnam’s most popular neighborhoods for shopping and dining. 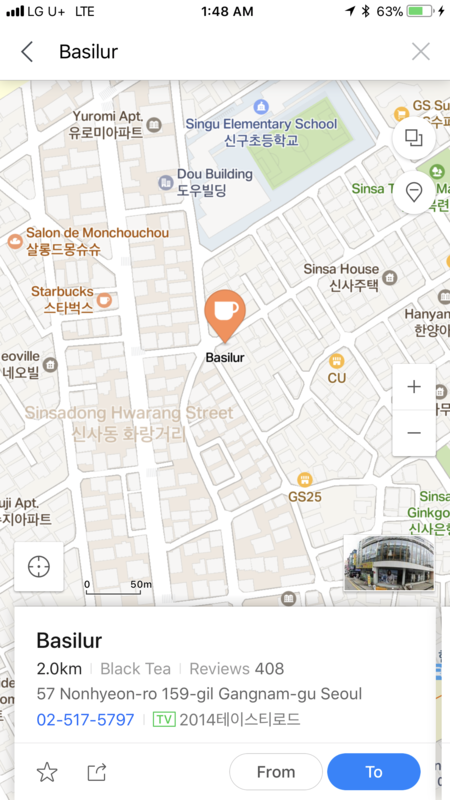 Its most famous shopping street, Garosu-gil, is lined with chic boutiques and trendy cafés. In a city full of Instagram-worthy cafés, you can find a number of them right here in Sinsa. One café you won’t be able to miss is Basilur Tea & Coffee. The shop takes up two spacious floors of a larger building on one of Sinsa’s side streets, and huge tin cans of branded teas are visible through the floor-to-ceiling picture windows. 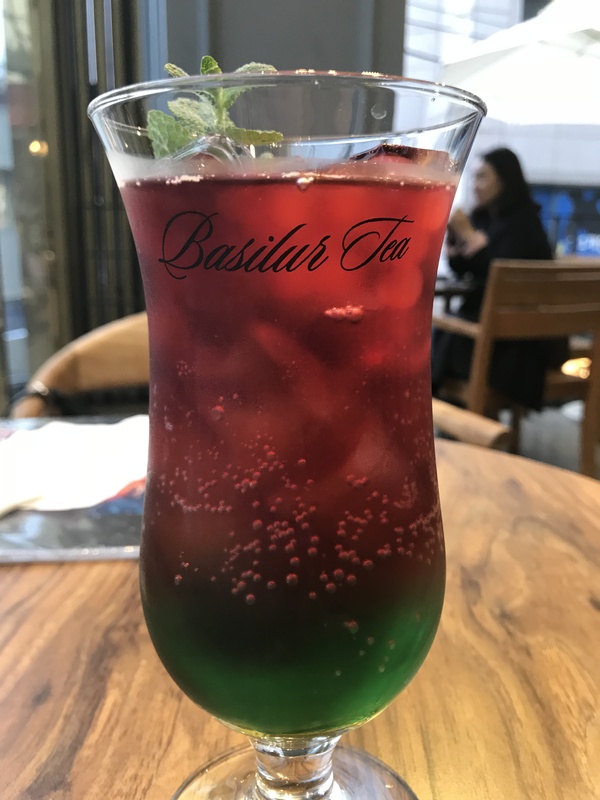 Basilur offers a wide variety of hot and iced teas, but I’ve always been drawn to the specialty “tea cocktail” menu for obvious reasons. To be honest, I was pretty disappointed to learn that these drinks don’t actually contain any alcohol. 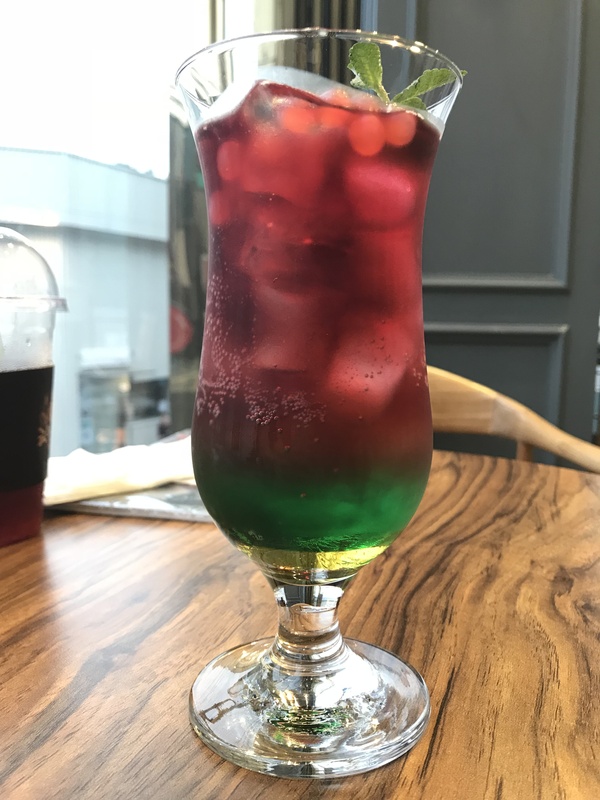 Why call it a tea cocktail, then, and tease me like that? I was ready to turn up at the tea house. 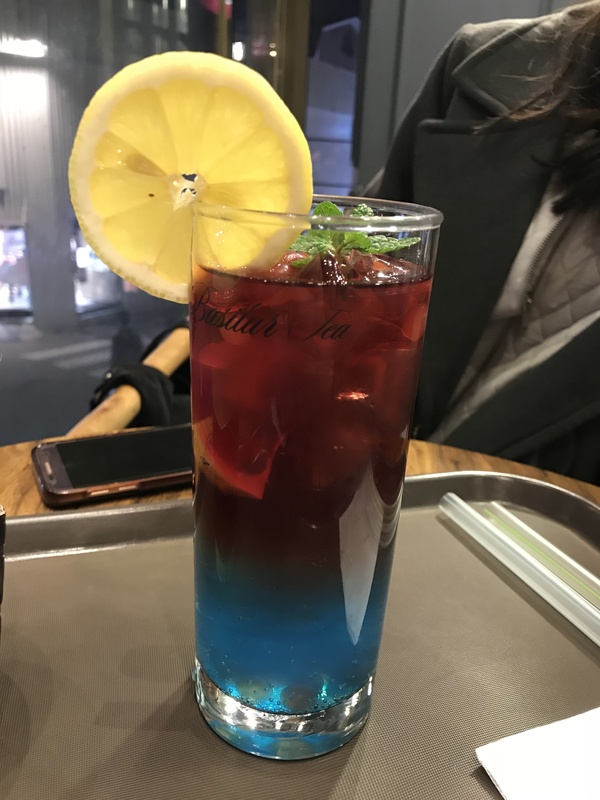 The tea cocktails come in many different color and flavor combinations, although they all kind of taste the same. Each runs around 6,800 KRW. They’re slightly bubbly, super sweet lemonades, more or less. We now know there’s no alcohol, and if there’s any tea, I definitely couldn’t taste it. 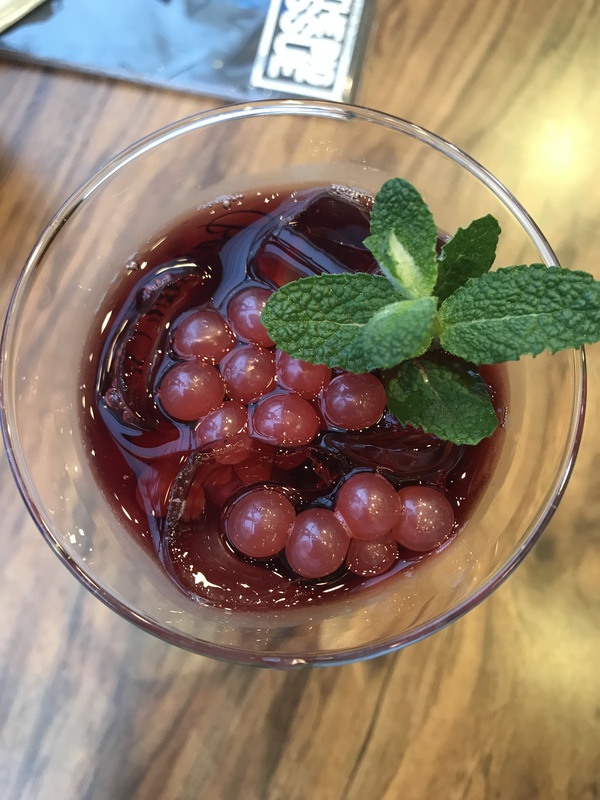 The coolest thing about the drinks are the boba-adjacent little tea bubbles inside. The balls are filled with even more sweet syrup, and they burst in your mouth, making the whole experience a bit more fun. I do actually quite like Basilur. It has great atmosphere for hanging out and chatting, and the drinks are sweet and tasty. Most of all, it’s aesthetically-pleasing. What more could you ask? 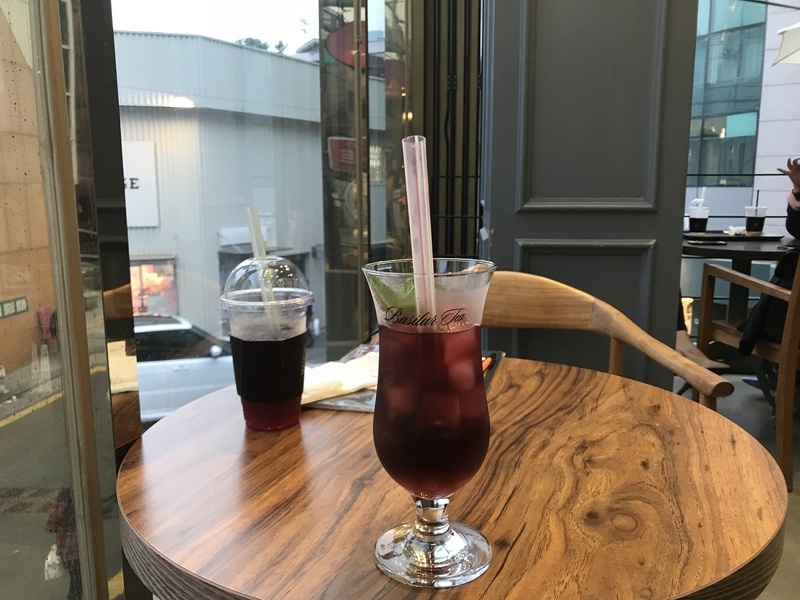 This entry was posted in Food, Korea, Seoul and tagged alcohol, basilur, Basilur Tea & Coffee, boba tea, bubble tea, cafe, cocktails, coffee, drink, food, Gangnam, Garosu-gil, green tea, instagram, korea, milk tea, restaurant review, restaurants, seoul, sinsa, sinsa-dong, tea, tea cocktail, tea house on July 14, 2018 by screamfmlondon. Where in the world can you sit elbow-to-elbow with strangers speaking dozens of different languages while chowing down on Michelin-starred food for less than $10? That’s Tim Ho Wan — the Hong Kong-based dim sum chain famously called the world’s most affordable Michelin-star restaurant. Dim sum and yum cha (drinking tea) date back to ancient Chinese traditions, originating with the Cantonese in southern China, when roadside teahouses were set up to give travelers and traders a place to rest and eat snacks along the Silk Road. 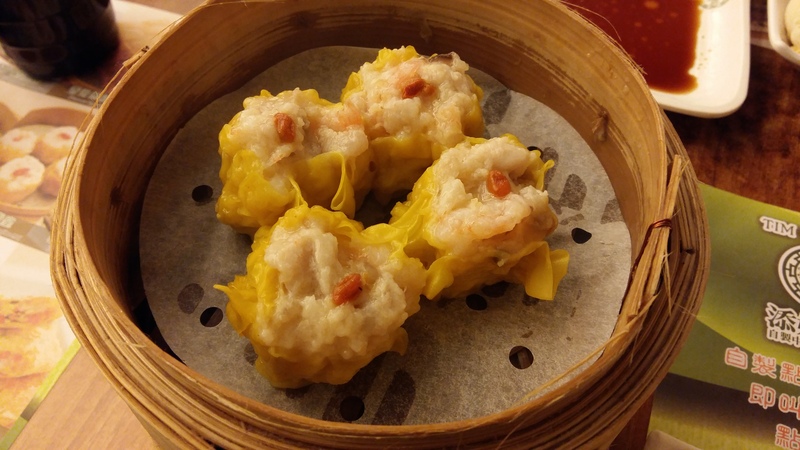 The bite-sized dim sum dishes are fully cooked and ready to serve from steamer baskets and small plates, providing the utmost convenience. Tim Ho Wan opened in Hong Kong in 2009, received its first Michelin star in 2010, and has since opened a number of additional locations around Asia. But nothing beats the original. To get a seat in the packed restaurant, diners have to take a number at the desk out front and wait patiently to be called. I rolled up optimistically hoping there wouldn’t be a crowd, but, well. There was. As I waited for my number to be called, I realized that I maybe should have studied some Cantonese numbers. Luckily, I was dining alone, so the hostess quickly plucked me from the crowd and led me inside to fill an empty chair at one of the bustling tables. I sat at a table where five other people were already dining, their delicious-looking plates covering the cramped space as I perused my menu. An elderly woman sat across from me, eyeing me skeptically as I did things incorrectly (man, I think you’re supposed to rinse off your plates and chopsticks with tea before the meal, but nobody told me what to do?!) and tried to help me use the correct utensils. After using a pencil to check items off the green paper menu, the food begins piling up quickly. 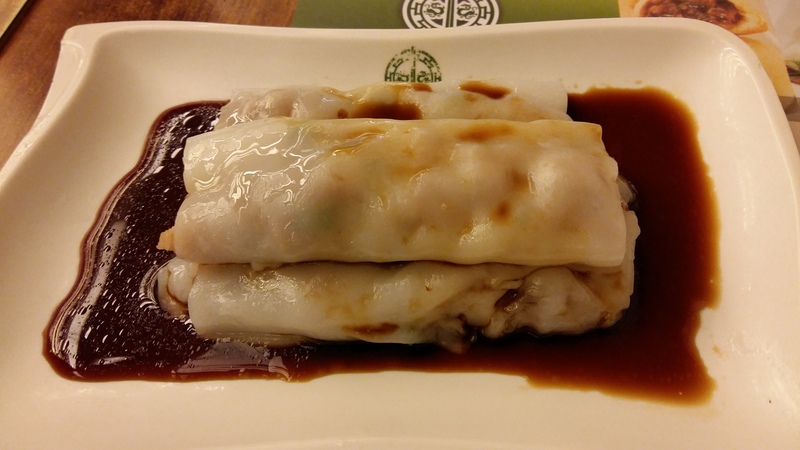 First to arrive was my vermicelli roll stuffed with beef ($21 HKD, or about $2.70 USD). Seasoned soy sauce is poured over the dish as soon as it’s placed on the table. These three rolls were super delicious — especially the two on the bottom that were able to soak more of the soy sauce into their rice noodle wrappings. The perfect tenderness and consistency, but I might have liked a little more beef flavor. As I was finishing up these rolls, my steamed egg cake ($16 HKD) arrived. Y’all, this was so amazingly good. 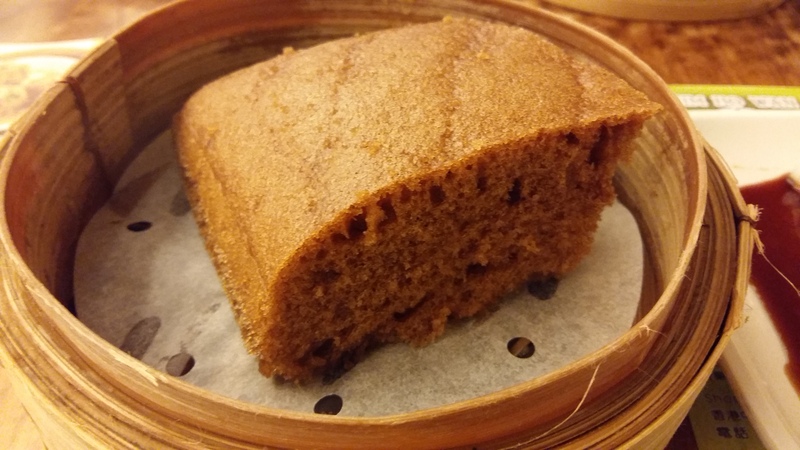 I was definitely expecting something that more closely resembled egg, but when a tasty, sugary sponge cake appeared, I was not mad about it. It was so light and fluffy with a tantalizing brown sugar kind of flavor. I loved this and could have eaten 20 of them. The Tim Ho Wan menu items I’d heard the most about were the baked buns with barbeque pork ($20 HKD for three buns), so I obviously had to try them out. These char siu bao did not disappoint! 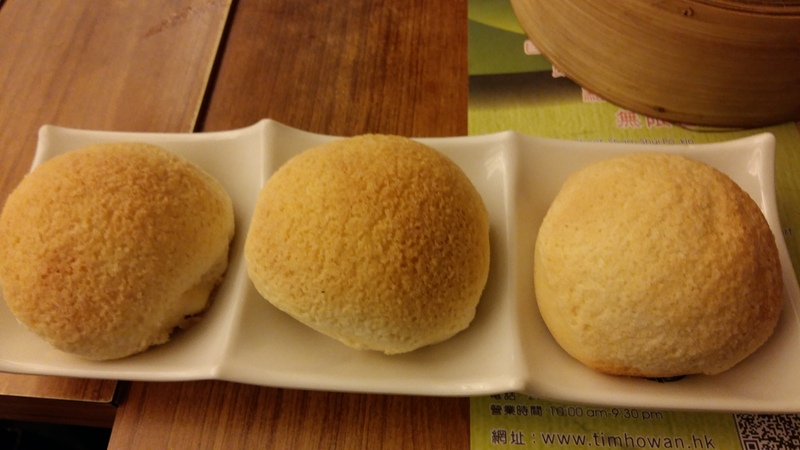 The three buns were served encased in perfectly-cooked, flaky breading. Slightly sweet and crunchy on the outside, but chewy and meaty on the inside. I think I could eat 20 of these as well. The texture is absolute perfection and the flavors blend together so well. These are Tim Ho Wan’s signature dish for good reason. Finally, I ended the meal with some steamed pork dumplings with shrimp ($27 HKD). I used to eat a lot of microwave shrimp siu mai from Trader Joe’s, but it’s an honor to get to try the real deal. These were great (what else did you expect? ), packed with shrimp filling and bursting with flavor. Hot and juicy, and the perfect way to top off a great meal. After the four small plates, I was feeling pretty stuffed, but so happy that I was able to taste these excellent dishes. It’s worth the wait, it’s worth the trip to Hong Kong — Tim Ho Wan is a fantastic dim sum experience. This entry was posted in Food, Hong Kong, Travel and tagged baked buns with BBQ pork, barbecue, barbeque, brown sugar, Cantonese, char siu bao, china, chinese food, dessert, dim sum, dining, dumplings, food, Hong Kong, Michelin stars, noodles, pork, restaurant review, restaurants, seafood, shrimp, silk road, siu mai, soy sauce, sponge cake, steamed egg cake, steamed pork dumplings with shrimp, tea, Tim Ho Wan, Trader Joe's, travel, vermicelli roll stuffed with beef, yum cha on September 20, 2016 by screamfmlondon.